There is no denying the fact that having an exercise routine is good for your health. If you are looking after your own health, you will be more than likely to have a better and more productive relationship with work. 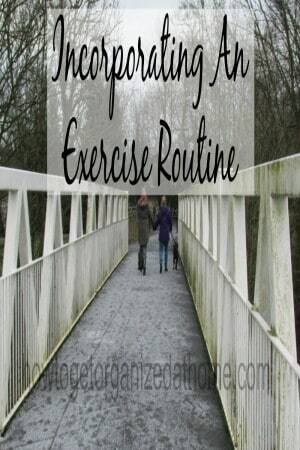 It is possible to fit into your weekly schedule some form of an exercise routine. You will witness the benefits to exercise over a period. It will improve your performance at work as well as home; you will be able to do more and not less. Exercise stimulates your mind and body and is a great way to reduce the stress placed onto the body or the mind. Exercise improves your health and fitness and this is vital at all ages. If you are looking to create more movement into your day, then consider the amount of time that you sit down; is it possible to reduce this time? Think about getting up and moving around. It could be possible to work from a standing desk; this is supposed to be better for your health. It also means that you are putting less pressure on some areas of your body. You need to have commitment to regular exercise, perhaps even finding an exercise friend. Mine is the dog, I have committed to walking her once a day, this allows me exercise time and I know she won’t let me forget. But finding something that you enjoy doing is important too, there is nothing worse than trying to squeeze in an activity that you hate, it will be the first thing you ditch when time is short. Having a healthier lifestyle adds to the impact that an exercise routine can have and work wonders as part of your new lifestyle. It is about understanding the health benefits rather than focusing on the scales; a person’s weight is important, but so, too, is measuring your improvements over a period of time with your exercise ability, muscle also weighs more than fat. A secret of speeding up your metabolism is strength training; making your muscles work and grow stronger makes them burn more calories than they would have previously. With age comes, for many people, the inability to lose weight as quickly as they once might. This is due to the muscles not working, growing and replenishing the worn out tissue. Therefore, by increasing the work that they are doing with incorporating strength training this can help to reduce your weight. If you are looking after your family and your home, it is important that you take the time to look after yourself too. It is going to make the jobs that you do easier to manage and you will also feel better. It is no good thinking about the past and how you have tried before, it is about now and the future, having an organized home and life is going to be easier if you put you and your health at the top of the to-do list.